New Zealand No 1 Michael Hendry starts today's final round of the NZ PGA Championship one shot off the lead - hoping to become the first man to retain the title since Frank Nobilo in 1987. But yesterday's third round belonged to Australian Rohan Blizard, who shot a six-under par 66 and almost matched a blistering 64 by fellow Australian David Bransdon - the lowest round of the week so far. Blizard, who leads on 15 under par, and defending champion Hendry (-14), will tee off in the final group on a day when six players look the most likely contenders. Australian Scott Strange is within striking distance at 13-under, countryman Leigh Deagan is 12-under and New Zealand's Gareth Paddison and China's Haotong Li are both 11-under. Seventeen-year-old Li also fired 66 yesterday after 65 on Friday, recovering well from an opening round 74. Hopefully, today's play will be quicker than the six hours it took the final group to get round. Hendry, 33, who wasn't overly pleased with his play yesterday and pulled a couple of drives after having to wait for the group in front, is confident he has the goods to deliver in the final round. A win would also be a massive confidence boost for Hendry, who is set to take on the world's top 50 players next week in the second event of the World Golf Championships - the winner of which will bank a cool $1.8m. "I'm pleased with the score, not particularly with the way I played. It was good enough to get the third round job done, I suppose," Hendry said. "My driving's been average for me. I generally drive the ball well and have been for some time. "It's a little bit aggravating, but I'll nip to the driving range and see if I can fix it." After overshooting the green on the 16th, Hendry holed an important seven-foot putt for a par three - which otherwise would have seen him start today two strokes back. "That was an important putt, it meant I kept some kind of momentum," he said. "It's good to be able to save pars when you're not hitting the ball fantastically. "Obviously the memories are good from last year, I'm solid enough to win it. It would just be nice to tidy the driving up a bit." Former Australian amateur champion Blizard, 28, who has one professional win to his name, was happy with his form yesterday, posting his lowest round of the week. 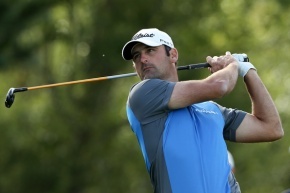 "I'm really happy with the way I played, I hit a lot of greens and gave myself chances to make birdies," Blizard said. "Overall it was pretty solid. The greens are pretty tricky to read out here so you've just got to be patient, you're not going to hole everything. "They're a little bit slower than what we're used to. But they're a good surface, you've just got to hit a harder putt." If Hendry can overhaul Blizard, he would join a select group of players to retain the national PGA title. Kiwi great Nobilo achieved the feat in 1987 - though there was no tournament played the year after his 1985 win. Sir Bob Charles nailed back-to-back titles in 1979-80, John Lister in 1976-77 and Australian Kel Nagle who won three on the spin from 1973. Rohan Blizard (Aus) -15, Michael Hendry (NZ) -14, Scott Strange (Aus) -13, Leigh Deagan (Aus) -12, Gareth Paddison (NZ) and Haotong Li (Chi) -11.